September 30th was my fabulous friend Kerry's birthday! only you but the recipient covet! "handmade feel" to it because of my not-so-great quilting. (if you have yet bought them :) I still need practiceto get better impression! The back side is her initial 'K' pieced. of the tissue box covers I made and hopefully other things too. Oh Kerry is so lucky!!! That's the best birthday present ever!!! I love the stamping. Did you use just stamping ink or is it something special? What a lovely gift! I think the stamp looks great. And thank you for the link to the tutorial and giveaway. 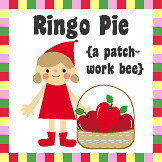 I'm going to try this paper piecing method. See if it works. Oh my goodness Kerry is going to squeal when she receives this! Totally gorgeous Ayumi!! oh wow Ayumi, you are so clever!. i just love the fabrics you use. and the clever way you put things together. Kerry will be thrilled!. I LOVED this when I saw it over at Kerry's. You never cease to amaze me!! oh my gosh ayumi, you're totally amazing. all those little details are just incredible, it blows my mind! You always inspire me, Ayumi! The mini is adorable, and what a sweet little pincushion. Happy gifts! Oh my gosh I love this. I love the red fabric with the sewing images on it. I am also in love with those leaf pins. So cute! Oh-oh-oh!!! Ayumi you always leave me speechless with your makings!!!!! 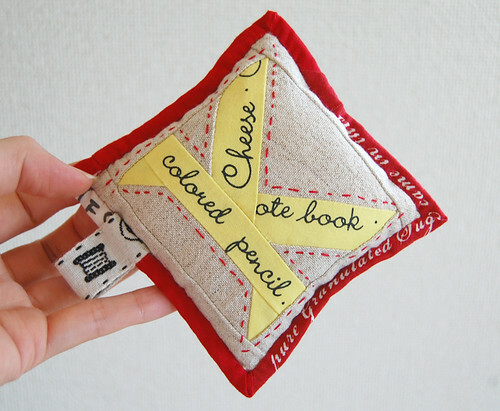 I have no words to describe how much inspiring/amazing is this mini quilt and the pincushion!!! Kerry is one lucky girl!!! that's really cute! What kind of stamps do you use? I love personalized labels. Such pretty gifts Ayumi! Kerry did make me buy the stamps and ink too.... they just arrived and I love the stamping!!!! What delightful gifts Ayumi, so special. Seriously though...totally adorable as usual. You are such a sweetheart!! I love your work it is adorable! Wowzers. So much thought and detail into every little part = so much love. 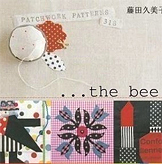 After the 5th or so study I realized that the piecing pattern mimics the red gingham. yep, I'm that slow. 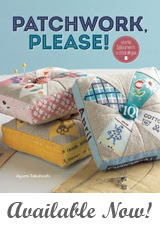 Ayumi, the quilt and pincushion are gorgeous!! I love all the interesting fabrics you have chosen and the way you have put them together!! You are so talented and skillful. 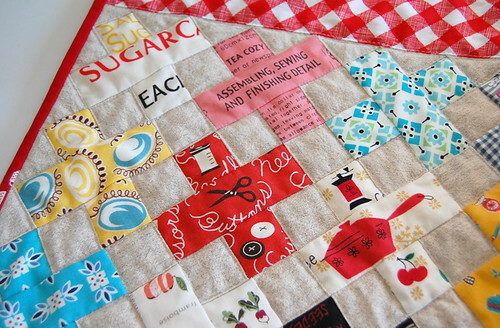 I particularly like the name tag at the bottom of the quilt - so clever! Do you use special ink? I would love to know how to do that. I want to sew some name tags for my boy's school uniforms, PE bags etc. 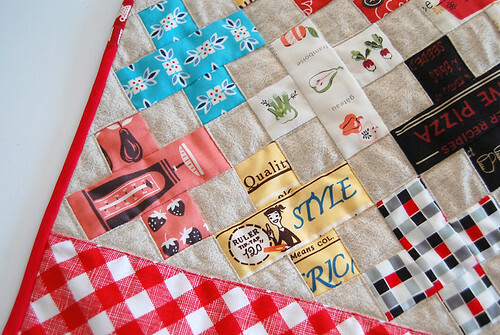 I have always been a great lover of typo fabrics and the way you used them and put all together is inresitible. But of course I fell especially in love with the cute pincusion and the initial "K"! Love it. Wow...Kerry is one lucky gal. This is incredible. I love the pattern, everything about it! So sweet! You are such a good friend and what beautiful work! I think the typography makes it really special. The K was pure inspiration! Kerry's quilt is so quintessentially Kerry and Ayumi! There was never a more perfect gift. 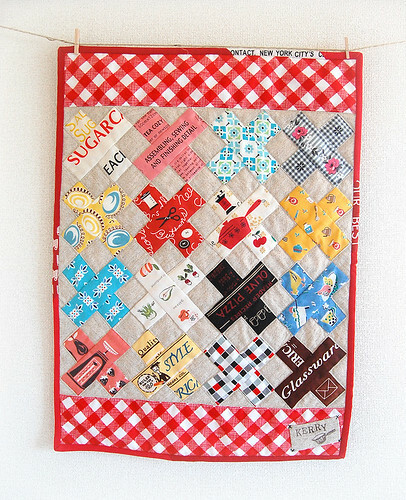 I just love all of the fabrics and especially the red gingham border on point - that's adorable!! your work is so gorgeous that i opened up this page and just left it open for 24 hours on the computer screen. every time i get on the computer (far too many times a day) i look at it and try to find the right words for how beautiful it is. it turns out that my language expression is no better with more time. "gorgeous" and "beautiful" don't properly explain how your work makes me feel, but those are the best words i can come up with. 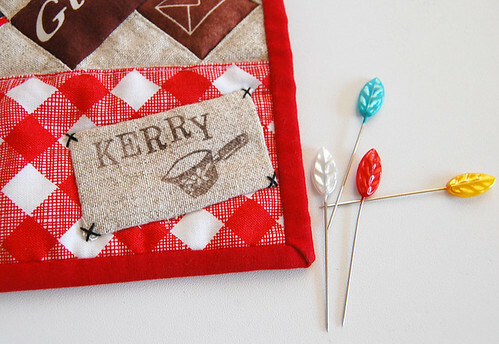 I'm so out of the loop - I didn't know we were calling pincushions 'pinnies' now! I was expecting an apron when I scrolled down. A pinny/pinnie is something you'd wear over your clothes while you did messy housework! They were usually nasty nylon and my mother stopped wearing them in the 70s. But I think they are made in nicer fabric now. Lucky Kerry! Your lovely gifts are so beautiful and thoughtful! A gift that makes a friend smile. Kerry is lucky to have a talented freind. Great job Ayumi. Ayumi, This is a WONDERFUL and VERY SPECIAL gift! I love it! Your friend is very lucky! Wow, what a great present!! Hi Ayumi...I came over for a visit to see what you've been up to and I'm glad I did! I just love everything that you make. 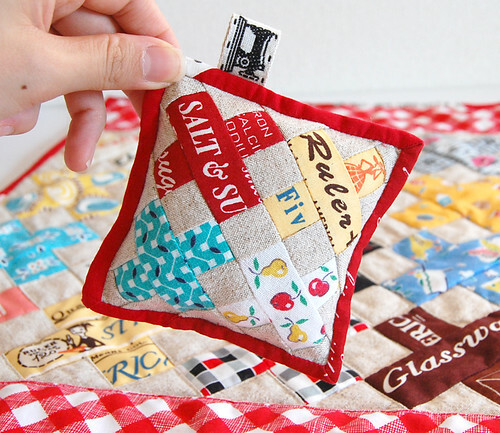 I love the mini quilt and I love that you used Sew Cherry red gingham. The pinny is adorable too. You always amaze with your talent! Hello! I'm happy to meet you and your lovely blog! You have filled it with so beautiful crafts and most great ideas! Thank you for sharing ideas and inspiration! "This is really a very fascinating post, thank you for sharing! but this 1 states precisely what I think also." I finally just started my own blog! Thanks for this great tutorial. I am now following you, and I'm also keeping this tutorial in mind because that could definitely help in my school and collage projects of students.